May reduce oxidative damage to lipids, enzymes and DNA. Contains antioxidant, anti-microbial and anti-inflammatory substances. Research conducted over the last few years into anti-ageing molecules has led to the discovery of fundamental substances capable of increasing life expectancy, in some cases, significantly so. 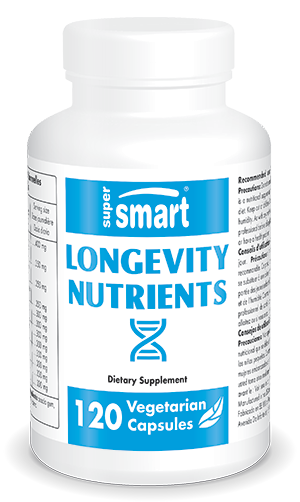 In a single, synergistic formulation, Longevity Nutrients combines the main substances now recognised as powerful anti-ageing weapons, capable of extending lifespan in perfect health. This complex can be taken on its own or alongside other anti-ageing substances, to complement and boost their effects. Still known as beta-alanine-L-histidine, this dipeptide is a molecule found in human cells with a long lifespan, such as skeletal muscle cells and brain neurons, but levels tend to fall with age - a decrease of 63% is seen in muscle tissue between the ages of 10 and 70. L-carnosine is recognised for its antioxidant properties, and its ability to reduce the process of glycation - the ‘caramelisation’ of proteins. It protects muscle cell membranes from oxidation and enables cardiac muscle to contract more effectively. It is one of a small group of ingredients capable of extending the lifespan of human cells in vitro. It has been shown in culture, particularly in lung fibroblasts, to counteract telomere damage and shortening by around 32%. In the presence of L-carnosine, human fibroblasts experience 8 to 10 times more cell divisions before becoming senescent, and thus cell lifespan is significantly longer. Animal experiments have clearly demonstrated that any substance capable of restricting the effects of insulin helps increase life expectancy. Indeed, this is also the level at which calorie restriction acts. Thus any substance that can reduce insulinaemia and glycaemia restricts the ageing process. Among the many plants used in Chinese and ayurvedic medicine is Berberis vulgaris, the berries of which contain a powerful plant alkaloid: berberine. This substance appears to be highly effective at increasing the cells’ sensitivity to insulin as well as at mimicking calorie restriction by stimulating the enzyme AMPK (Adenosine Monophosphate Kinase) which prevents or repairs cell damage. In addition, it is endowed with anti-cancer properties, it protects the vascular system, maintains bone density and has a preventative effect against dementia. Berberine’s action in the body is similar to that of the drug Metformin but it has none of the latter’s minor risks. Metformin’s ability to extend lifespan in mammals has been widely demonstrated. Plant polyphenols have demonstrated particular promise in resolving problems associated with ageing. Apple polyphenols have been shown to extend lifespan by 12% in three recent studies conducted on yeasts (Cerevisiae), worms (C. elegans) and flies (D. melanogaster). They appear to work by activating genes that stimulate endogenous antioxidant defences and by inhibiting other genes involved in premature death. Epidemiological studies confirm that consumption of flavonoids in general, particularly those from apples, is positively associated with human longevity. Among the polyphenols found in apple peel is phloridzin, a flavonoid from the chalcone group which reduces resistance to insulin and is effective at combatting glycation via several synergistic mechanisms, including a specific effect on the membrane of the small intestine. This mechanism is also behind the decrease in visceral fat stores. In addition, apples are rich in chlorogenic acid, catechins, epicatechins and various tannins which are also potent antioxidants (with an ORAC value three times that of green tea extract). Apple polyphenols protect against free radicals, in particular by inducing a 20%+ increase in the activity of paraoxanase, an endogenous antioxidant. In the context of anti-ageing, they are mainly used as preventive, anti-cancer agents as they reduce the risk of colon cancer by almost 50%. Reishi has been used medicinally for over 2000 years and was justifiably known in ancient times as the ‘mushroom of immortality’. Over recent decades, researchers have been focusing on analysing its various compounds. Science has thus confirmed that reishi has multiple properties which provide the body with all-round protection against a variety of diseases that unquestionably reduce longevity. the peptide Ganoderma lucidum, which has both powerful antioxidant properties and a protein called LZ-8 that activates immune-regulating receptors. What makes this mushroom unique is its ability to act in several places at once, triggering important changes that contribute to increased longevity: it protects cell and mitochondrial DNA from the oxidative damage that contributes to ageing and cancer, it increases expression of a longevity gene and extends life expectancy in a number of species, from yeasts and simple worms to mice and other mammals. Researchers investigating its effects in laboratory mice clearly demonstrated that reishi consumption was associated with an increase in the animals’ lifespan of between 9% and 20%, which equates to 16 additional years for humans. Centrophenoxine was developed in 1959 and has been widely used for more than 30 years to treat brain disorders associated with ageing and changes in memory. It consists of two substances, DMAE (dimethylethanolamine) and PCPA, both of which are potent antioxidants that protect the brain from radical damage. It counteracts age-related decreases in protein DNA, re-enabling information to be stored in the long-term memory and improving alertness, after just a few weeks’ supplementation. Centrophenoxine supplementation is thus extremely effective at combatting ageing of the brain, improving cerebral and neuron function and oxygen consumption, and capacity for memorising and concentrating. Above all, centrophenoxine is the only known agent that can reduce accumulation of lipofuscin, an ageing-related toxin, in the cells of the brain, heart, lungs and skin. Cells ‘invaded’ by lipofuscin, a kind of metabolic waste product, lose the ability to communicate and function correctly. Long-term administration of centrophenoxine has been shown to significantly increase lifespan in laboratory animals. Traditionally used to reduce feelings of stress, anxiety and fear, L-theanine - derived from the leaves of green tea (Camellia sinensis) - has also been shown to be a specific anti-ageing amino acid. Taking high doses of L-theanine is known to have an effect on obesity, hypertension, heart rate, blood lipid levels and cancer risk. German studies by human nutrition researchers, conducted on C. elegans nematodes, are now indicating that this substance can prolong lifespan by between 3.6% and 4.4%. According to the researchers, “Taken together, these findings suggest that this compound may be worth evaluating in mammals and humans with regard to the prevention of ageing”. or resveratrol, a calorie restriction mimetic which overall increases lifespan. For long-lasting support in the fight against ageing, you can alternate between Longevity Nutrients and other anti-ageing supplements. The formulation AMPK Booster, for example, combines three natural extracts for reactivating AMPK, while the complex Natural Rapalogs contains five natural inhibitors of the mTor signalling pathway. You may also be interested in the innovative anti-ageing molecule Nicotinamide Mononucleotide (NMN).